Anyway, I’ve always avoided putting these kinds of things on my blog because a) I find them rather annoying, and b) I assumed that relatively few people ever really clicked on them. Apparently, an 18-year old guy from Pickerington, Ohio stumbled upon my entry from back in November of 2006, in which I commented on Premiere magazine’s list of the Top 20 Overrated Movies of All Time. It’s always been one of my most popular entries, probably because of all the Google-friendly keywords in the text. Anyway, by “most popular,” I mean it gets 10-30 hits per day. Yesterday, though, thanks to Mr. Pickerington, Ohio, that page received 520 pageviews! And 90% of them came directly from the StumbleUpon page. Measuring Earthquakes – Web 2.0 Style! Los Angeles had a 5.4 magnitude earthquake yesterday. There are geological sites all over the web if you want information, but I found this page at the U.S. Geological Survey site particularly interesting. It asks people who felt the quake to fill out a web form that includes their location, the amount of shaking and the amount of damage. As of this writing, they’ve had almost 40,000 respondents, which produces are pretty accurate zip-by-zip map of the quake. Anyway, every time I visit the house, I wish I could take our friends & family through it for a tour, but alas, some people live far away and we’re busy just about every weekend with the above-mentioned decision making. So instead, I’ve recorded a “virtual tour,” available by clicking in the Featured Video section on the left of this page. First, it’s almost a half hour long, so only click if you’ve got some time to spend! If you want to browse around the house at your leisure, I’d recommend the photo slide show, which was started when the project started, and is updated every couple of days with new photos and commentary (click on the “i” in the middle of the screen to see the captions). Second thing to note: YouTube has a 10 minute limit on videos, so I had to break it out into 3 parts. The Featured Video section on the left has three links under the picture (or, if you wish, here they are: Part 1, Part 2, and Part 3). So feel free to peruse the pictures and videos and leave your comments here. We’ll keep you all updated as things progress (next up: sheet rock!) and, of course, when we actually move in. The geeks are at the gates, and they’ve brought their virtual light sabers. When it comes to nerdery, the legions who camped outside Apple’s stores last month to buy the iPhone have nothing on the developers Apple let loose to write software for it. 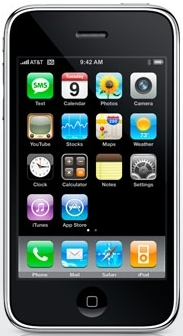 At least three applications turn the $199 iPhone 3g into a flashlight. Another, World 9, lets out a vintage Nintendo bleep every time you bump the phone. In less than 15 minutes you can load up the iPhone with enough junk to make esthete Steve Jobs lose his vegan lunch of brown rice and broccoli. Science: Novak’s brain tumor may have affected his vision, his judgement or his consciousness, causing him to hit a pedestrian with his car and drive away without noticing. Religion: Novak hit a pedestrian with his car and drove away, and now God is punishing him with a brain tumor. Federal Reserve officials marked up their outlook for inflation and economic growth in their latest projections. But their estimates suggest little expectation that underlying inflation trends will deteriorate significantly through 2010. At the June policy meeting, officials projected that the rate of economic growth by the end of the year would be between 1% and 1.6%, up from 0.3% to 1.2% in their April estimates. The 2009 outlook was unchanged, with officials expecting growth between 2% and 2.8%. Fed officials marked up their inflation projections for this year, measured by the price index for personal consumption expenditures, to between 3.8% and 4.2%, up from the 3.1% to 3.4% seen in April. The outlook for inflation next year was 2% to 2.3%, up only slightly from the 1.9% to 2.3% from the April meeting. Expectations for the unemployment rate, now 5.5%, was unchanged at 5.5% to 5.7%. Translation: in the coming months, the economy’s anemic growth rate is expected to increase, inflation is expected to remain high, and the job market is expected to remain relatively stagnant. Here’s the thing: increasing prices (particularly for food and fuel – two things everybody buys in one way or another) and the stagnant job market affect people directly in the pocketbooks. Times are tough, especially for those on the lower part of the income scale. This is a real problem that we should take steps to correct, whether it be tax policy, interest rate management, stimulus packages or anything in between. But despite these problems, our economy is growing. In other words, it may feel like a recession, but it isn’t a recession. In still other words, things could be a lot worse. The growing economy is what’s keeping the job market from falling apart, keeping wages stable, and probably keeping inflation from spinning wildly out of control. All of the above isn’t particularly good news, but it’s probably a relatively non-controversial message. That is, unless you happen to distinguish between “feels like a recession” and “is a recession” by using the term “mental recession” and tagging the people who keep calling it a recession “whiners.” Then, it’s very controversial. And, suddenly, both candidates (who are supposed to be pitching their economic plans to us) have to distance themselves from you. Also, the various pundits and economic experts that pepper out national media lose the ability to analyze what you meant, instantly ignore your impressive resume when it comes to economic matters, and choose instead to characterize you as a nut-ball who suddenly and inexplicably lost his mind. They told me that when the election came around, the central issue would be achieving victory in Iraq . . . and they were right! Of course, I assumed they meant victory for America versus victory for Al Qaeda. Turns out, the debate is really about whether the victory belongs to John McCain or Barack Obama. Here’s the context: John McCain has been a staunch supporter of the President’s Iraqi strategy for some time now, particularly on the “surge” of 30,000 troops and on drawing down our forces based on “conditions on the ground,” rather than a pre-determined timetable. Barack Obama, on the other hand, famously predicted that a surge would not reduce violence in Iraq but would “do the reverse.” Obama has also repeatedly stated that as President, he would withdraw our troops at a rate of 1-2 brigades a month, until the last of our combat troops are home after approximately 16 months. Now, Iraqi Prime Minister, Nouri al-Maliki, has publicly stated that due to improved conditions in the country, the upcoming end of the U.N. charter that allows U.S. troops to be in Iraq marks a good time to start discussing a rational draw down of American troops. He “aspirational timeline” is a full withdrawal of all combat troops by the end of 2010. The good news is, it looks like the Iraqi war finally has an end in sight. The political debate, then, turns to who was right and who was wrong. McCain claims that Maliki’s statements reflect what he’s been saying all along – improvements in the situation on the ground have created a scenario in which troop draw downs can begin. Obama claims that Maliki agrees with his timetable (the end of 2010 would be roughly 23 months after Obama takes office which, one presumes, is close enough to 16 months to claim victory). A: No, because keep in mind, that . . . hypotheticals are very difficult, hindsight is 20/20, but I think that what I’m absolutely convinced of is that at that time, we had to change the political debate because the view of the Bush administration at that time was one that I just disagreed with. Talking points, of course, are not new to political campaigns. What is new (or at least newer) is the transparency Americans now have when a candidate says what he wants (only) a particular audience to hear. Thus far, I’ve perceived Obama to be the more thoughtful, fact-based candidate. But ever since the primaries ended, he has mirrored McCain in his willingness to substitute “message” for “content.” I can only hope that changes for both candidates in the near future, lest we all wind up electing the guy with the best speech writers, rather than the best candidate. I’ve been saying for many years now that the killer app on the iPod has not yet been written. However, with the release of iPhone 3G (and, more specifically, the App Store), Apple has moved one step closer to that holy grail. But not quite all the way. Allow me to explain myself. The killer app for the iPod, I believe, is one that will allow me to listen to Internet radio (or even broadcast radio) on my iPod, hear a song I like, and push a button to purchase that song for $0.99 and download it to my iTunes music library. I call this the killer app, because it opens up something that ITMS doesn’t really provide today – the awesome power of the impulse buy. When you have a product that sells for $0.99, you want, nay, you NEED your customers to be able to go from “want” to “have” in less than a second. Make them think about for any longer than that, and most of them will move on to something else, never to return to that fertile moment. Just as an example, imagine a school bus full of teenagers, all with iPods (attached to their parents’ credit cards), and all dishing to each other about the awesome new song that Bon Jovi (or whoever) just put out. Now, imagine that song comes on the radio, and one kid says, “Ooh…I’m buying it right now!” <Click>. What happens next? That’s right: <Click>, <Click>, <Clickety-click-click-click-click>. Ca-Ching! Obviously, there are (or were?) several technical issues standing in the way of my killer app scenario. But, reports are out today that Apple’s new App Store is rife with several music-related applications(costing between $0.00 and $9.99) that bring iPod functionality into that wonderful, WiFi-enabled, 3G world of theirs. First, there’s Last.FM, which isn’t really radio, but still lets you listen to large quantities of streaming music for free (just like radio). The iPhone app gives you a link that will let you purchase the song you’re listening to via ITMS on a WiFi connection. It’s close, but it’s only relegated to the Last.FM userbase, so the social network atmosphere I describe above doesn’t really get to fully spread its wings. Then there are Shazam and Midomi Mobile. Shazam allows you to hold your iPhone’s microphone up to a music source (e.g., a radio), at which point it will pattern-match to figure out the song it’s hearing, and then provide you a link to purchase the song via ITMS. Midomi Mobile is even cooler, in that it let’s you sing/hum a few bars of a song, and then plays a hi-tech version of “Name That Tune.” If it’s right (and, I suppose, even if it’s wrong), you can buy the song you just hummed with a single click. Once again, very close, but you still need someone else’s radio (or a good singing voice) to make it work. Also, for those who haven’t heard yet, the guest stars in the second show (July 18, 2008 – the true“Last Play at Shea” were somewhat different than the show I saw. Tony Bennett reprised his appearance, but John Mayer, Don Henley and John Mellencamp were replaced by Steven Tyler (“Walk This Way”), Roger Daltry (“My Generation”) and the Sir Paul McCartney (“I Saw Her Standing There” and “Let it Be”). From what I’ve read, the Who song was punctuated by Billy Joel smashing a guitar on stage – a nice throwback to that signature move by The Who. But it was the McCartney appearance that really tells a story: The Beatles were the first rock show to perform at Shea Stadium, and in doing so, they changed the face of American Rock & Roll forever. It was more than fitting that Sir Paul came out to sing in this, the stadium’s last rock show. 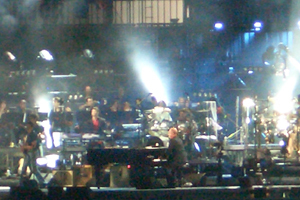 Even more fitting was the way in which Billy Joel gave up his stage (and his piano) after the vaulted Piano Man, and allowed Sir Paul to close out the stadium with the classic Let It Be. Billy Joel has always had a lot of class. That finale not only showed his class, but also his deep respect for the history of that great institution that is Rock & Roll. Bravo, Billy! Bravo, Sir Paul!